There are more definitions for resilience than you could shake a stick at. Here we look at resilience from the context of an adolescent’s capacity to endure periods of intense stress without any long term negative impact on their mental health. Some brains are simply better able to weather the psychological duress of having to deal with the types of common childhood stresses known to leave kids vulnerable to mental health issues. These include poverty, neighbourhood violence, struggling schools and mental health problems of the parent(s). If you take a few moments to mull it over, it becomes obvious how these circumstances could leave children frazzled by an overwhelming burden of worry. Here’s one perspective. If parents have no room for financial manoeuvre, only just managing to keep up with the bills week after week, then there won’t be any spare cash to help the kids to get their hands on the material goods that they covet; whether it’s clothing, toys or tech. 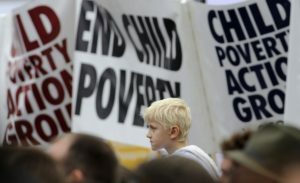 Children from all walks of life can show a spiteful streak when it comes to giving hell to whichever kid happens to stick out in the playground for being different and there are many all too obvious signs of being poverty-stricken that may lead to being singled out. If the merciless teasing becomes relentless then it has the has the potential to become problematic. While the bullying aspect might seem like a relatively minor issue in the stress-inducing stakes compared to going to bed cold and hungry, but the child’s perception in these matters is everything. The social stigma attached to being less well off than everyone else can damage self-esteem, particularly when it’s the source of daily playground mockery. If a kid is made to feel ashamed over and over again at school, for whatever reason, then chronically elevated stress levels can be potentially damaging to some of the critical processes of neurodevelopment. And as we shall discover below, brain pathways that connect frontal lobe regions with those on the inner surface of the cortex, appear to be particularly important in the resilient brain. The other three sources of childhood stress could also be viewed as relentless, thereby having potential for impeding important neurodevelopmental processes: the ever-present threat of getting sucked into neighbourhood violence, the perpetual turmoil induced by a primary caregiver whose mental illness makes home life a living hell and schools in which teachers struggle to wrestle order from chaos – all can send levels of a child’s cortisol (one of the stress hormones) shooting up on a daily basis over extended periods of time. Often there is little hope of making a meaningful impact on the external factors that conspire to send cortisol levels rocketing (poverty, parental mental illness etc) so the focus has shifted to trying to understanding the key factors involved in determining whether a child ends up with a resilient brain or not. Can interventions aimed at helping to build resilience in young people actually work? And what makes the critical difference in the makeup of brains that are able to endure high levels of stress without any long term complications and those brains that succumb? According to Harvard University’s Center on the Developing Child, resilience is built up over the course of childhood and involves four special ingredients. Two of these relate to a sense of meaningful attachment – close supportive relationships with specific adults and a broader range of looser connections that embed a child within a defined community. The last two components relate to the development of specific cognitive capacities that improve a young person’s well-being by making them feel both able and in control. The first ingredient is supportive adult-child relationships. This might be a parent or relative, but it could also be a teacher, trainer, coach or anyone else that can be relied upon to provide support when it is needed. A person the child knows will take the time to listen to them, offer guidance and essentially help them to feel that they do not have to take on the trials and tribulations of life alone. The second ingredient is feeling a part of some kind of broader cultural tradition, one that might give the child a sense of hope and faith that transcends the mundane goals of normal, everyday activities. Usually groups that provide this are centred around one or other of the mainstream religions. 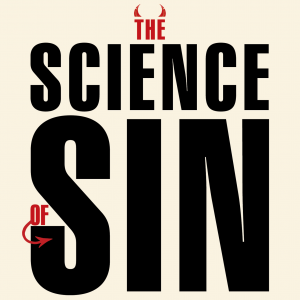 As I outlined in my latest book The Science of Sin, while science is great at identifying the critical factors that lead to good physical and mental health, it usually comes up short when finding fixes for the problem of social isolation. Being a part of a sports team or hobby group can provide a sense of being part of a community, but these options pale in comparison to traditions that provide an overarching philosophy on how to live a good life, a dedicated building in which to come together with other members of the community and a policy of encouraging acceptance of well-intentioned strangers. I don’t believe in God myself, but I have seen the capacity for people’s religions to give them a sense of hope and support in the face of inconquerable odds. For this reason I can see why the Harvard Institute on Child Health would have observed that helping children to connect with others from their traditional faith group can help them become more resilient. One of the two cognitive facets that needs nurturing to build resilient brains is the development of self-efficacy: feeling able and in control. The other is the ability to adapt to change and self-regulate behaviour. This boils down to being able to maintain a sense of being in control, even when adjusting to changes that are beyond the child’s control. Learning to self-soothe – calming yourself down when emotions start running high – is a key component of this skill. Mindfulness meditation has been identified a great way to develop such skills. It has been implemented in schools struggling with poverty and violence with phenomenal outcomes in terms of improved attendance and scholarship (Read about a compelling example of this here). What Does A Resilient Brain Look Like? 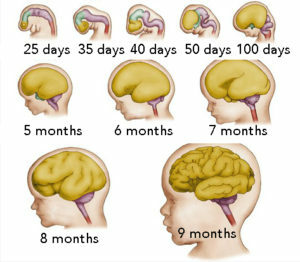 Over the course of childhood our brains go through a series of vast and incredible changes. In the womb the outer cortex of every human foetus’s brain starts out as the tip of an extremely narrow and short tube. Over the course of the pregnancy, brain cells in this structure multiply at an astonishingly fast rate, migrating to form a six-layered sheet of densely interwoven brain wires (neurons) and a vast diversity of support cells (glia), eventually taking on its familiar, walnut-like, wrinkly, appearance by the time of birth. Having successfully made it’s way out of the womb and into the big wide world, the infant’s brain cell multiplication steps up a gear to achieve it’s full complement of 86 billion neurons by the age of five. From here on brain growth is mostly a case of making those neurons larger, developing the system of myelination whereby glial cells called oligodendrocytes apply a layer of electrical insulation to the brain wires to speed up the transmission of messages and each of those neurons make thousands of connections (synapses) with other neurons. MRI scans can track both of these processes with serial brain scans conducted at various stages of development – the progression of myelination can be observed by taking measure that correlate with white matter integrity and other measures can be used to track changes in the thickness of the surrounding grey matter. Interestingly, when a human brain reaches adolescence, rather than getting bigger and bigger, creating more and more synapses, the brain shifts gear . 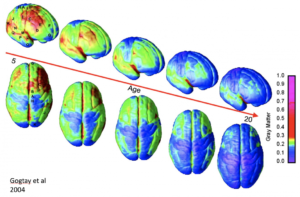 During adolescence the outer cortex of the human brain doesn’t simply get thicker and thicker. More new synapses are being created as the teen increases their repertoire of skills and abilities, but that is not the only process that is taking place at this stage in neurodevelopment. The synapses connecting together brain areas involved in supporting the improvement of their language, thinking, movement, memory and reasoning skills ARE being selectively bolstered, reinforced with extra synaptic connections to make the communication between relevant brain areas more efficient. Yet another process is simultaneously underway across the whole brain which causes the outer cortex to become thinner, overall, during the teenage years and beyond. The countless unused brain pathways are trimmed away, while those that are being used on a regular basis are maintained. As the former process of “synaptic pruning” progresses at a much faster rate than the latter, the net result is a thinning of the cortex. The rate at which different parts of the brain go through this process of cortical maturation has been tracked by an incredible team of neuroscientists in Paul Thompson’s lab. The process seems to reach completion first in the sensory parts of the brain at the back and sides of the brain, and last in the parts of the frontal cortex supporting higher level cognitive functions. 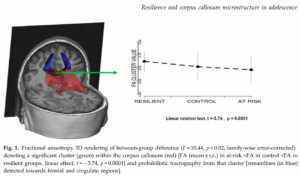 Going back to the resilience study, Galinowski and colleagues observed that the integrity of the white matter tracts (NB neuronal brain wires wrapped in myelin are less dense than the outer cortex which is jammed full of synapses and cell bodies so it looks white in brain scans rather than grey) was higher in the front-most part of the corpus callosum in the brains of resilient adolescents versus vulnerable ones. When they ran tracer studies to see which brain areas were connected to each other by these particular information superhighways, the areas in question were frontal lobe regions involved in self-regulation and the anterior cingulate cortex; a brain area that should be familiar to anyone who’s read The Science Of Sin. The dorsal part of the ACC is known to be involved in the perception of physical and emotional pain specifically; and processing “conflict” more generally.